During my overly imaginative childhood, I had dreams. I planned to sing and dance my way to stardom. If that didn’t work I’d be a world-famous accordionist. This was most likely influenced by watching too many Lawrence Welk shows …required viewing in my parents’ home. My folks thought the accordion was the safest “dream of the week” so Dad rented one and made sure I got to my weekly lesson. Mom made sure I practiced. While my friends labored over their common place pianos, clarinets and guitars, I proudly marched forward with my accordion. After the Silent Night church recital and Skaters Waltz performance for my grandparents, Dad bought me my very own. It was red and shiny and I loved it. As I launched myself from the middle of the kitchen floor to give him the biggest hug ever, my head made contact with his finely chiseled nose. He whirled around, stepped (briskly) out to his garage …. where he stayed for quite awhile. Dad’s nose recovered and I went on to learn a rousing version of the William Tell overture. Eventually the lessons stopped and I never became world-famous…which you’ve probably figured out by now. Like so many childish plans, the accordion dream went by the wayside. It took Dad awhile to stop flinching when I moved in for a hug. Fast forward 20+ years …. I begged my parents to come to Alaska for Christmas. Mom was certain Dad would never agree….”he hates the snow, you know that”. I admit I was selfish. I wasn’t thinking about Dad’s snow issues. I wanted them to come and continued to plead. I assured Dad the weather in our area was relatively moderate. Remember that word – – – “relatively”. Coldest temps hovered in the teens and 20s. And we’d had a couple Christmases of practically no snow at all. Were I a bit more compassionate back then, I would have understood Dad’s problem with the fluffy white stuff. A WWII vet, he served during the bitterly cold Battle of the Bulge. For weeks, from December 1944 thru January 1945, they battled not only the enemy, but severe cold and frostbite. Unlike some, he resisted the urge to take his boots off to alleviate the pain…a choice which ultimately saved his feet. When I asked how he was rescued, he stared blankly. “Well, I guess we rescued ourselves”. He explained there were no convoys to drive them, there was no helicopter to fly them. They walked. And they carried their buddies who couldn’t. That’s some tough soldiering. For his part he was awarded a Purple Heart and months of treatment from a field hospital in France to New York City to Fort Carson, Colorado. He made it home many months later with all his fingers and toes…one of the lucky ones. It’s no wonder he hated snow…and likely the reason he and Mom settled in a quiet, coastal town in sunny California. Mom and Dad did come to Alaska that Christmas. And as the law of averages would have it we had the biggest snowfall EVER just days before they arrived. 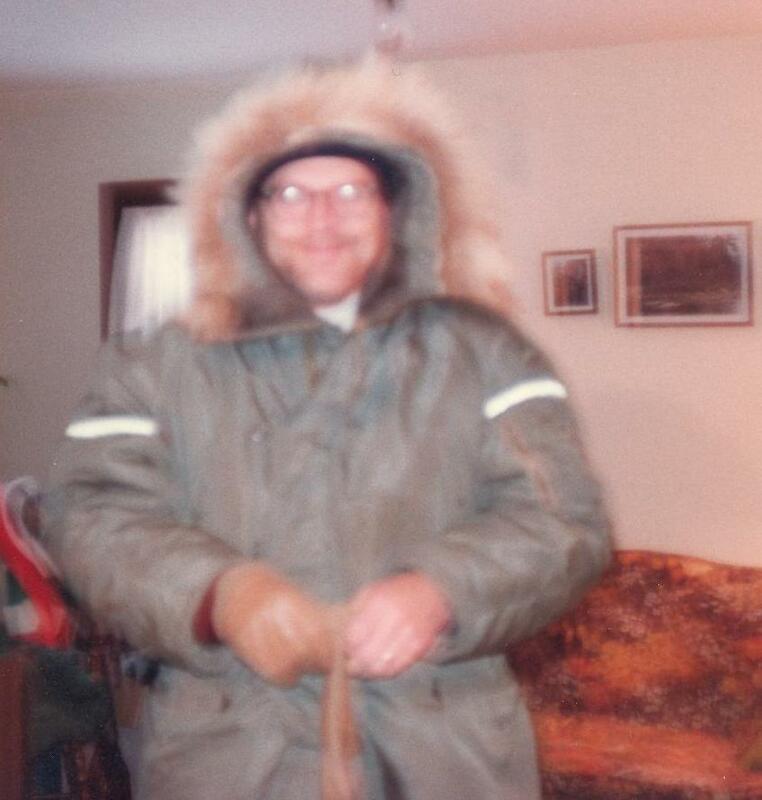 The day I picked them up from the airport….the temp dropped to 30 below zero. The heater in my car blew out and I had more ice on the inside of the windshield than the outside. And like the good soldier he was and is, Dad spent his first day of vacation outside with Doug, still 30 below zero, installing a new heater core in my car. Good thing this is blurry...it was a little scary to see my father like this! I’ve just returned from spending several days with he and Mom, a rare Father’s Day visit. 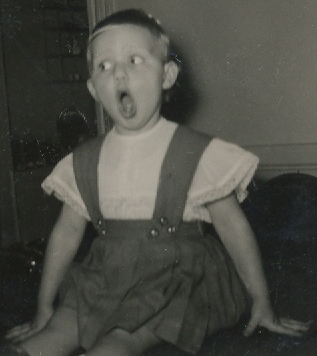 We looked at old photos …. laughed at the funny and not so funny times. They are amazing givers and I am always overwhelmed at what they’ve done for me and my family. In spite of the trials, tribulations and misadventures I inflicted upon them…. they kept coming back to visit no matter where we lived. I understand it all now after raising my own family. You do things for your kids to encourage, to teach, to share …. and to just be with them. And in the end the failures and flubs don’t matter. All that is left is the connection and relationship…..and in my case, a shiny, red accordion…. a little on the antiquey side now. 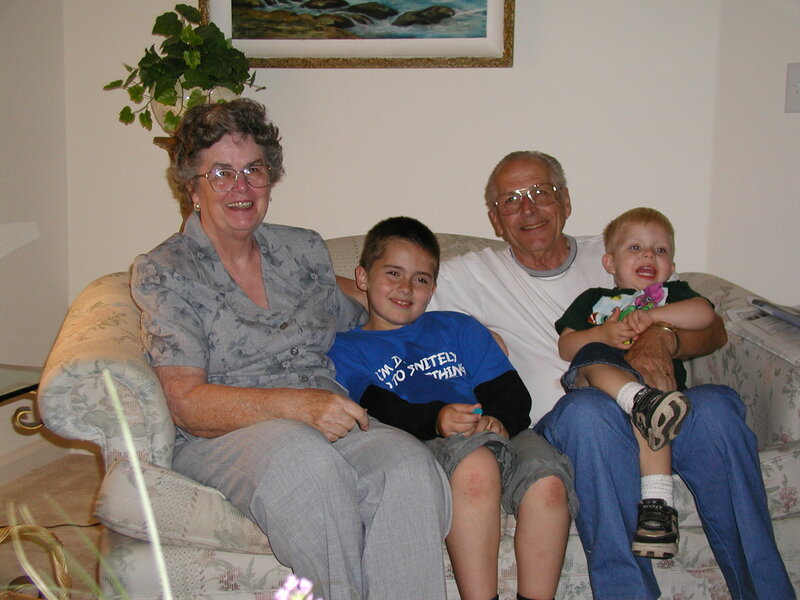 Mom and Dad, a few birthdays ago with two great-grandsons. Good to have you back, glad you had a safe trip! Yes, families are puzzling things sometimes – what are they thinking?! But, as we remember stunts we have pulled, it is amazing what our parents tolerated…helps me to be more tolerant. As you said, the connection and the relationship are the most important. We have a lot of shifting going on this summer: kids coming and going and moving on to new things. For me, it’s a matter of figuring out how to adjust to all the changes – with acceptance and grace. We have some shifting coming up soon, but more to do with an older family member and what to do with our ancient old house. Thanks for sharing the words acceptance and grace – – good words to reflect on today. What a heartwarming story, Brooke…thanks for sharing. And please thank your father for his service to our country…God bless you and your family.